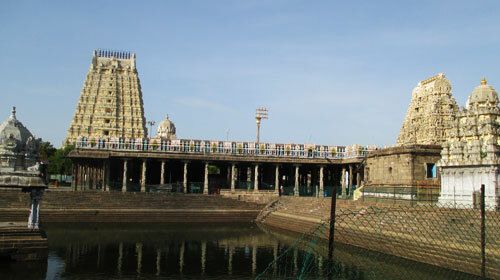 The Ekambareswarar temple in Kanchipuram is a Hindu temple dedicated to the worship of Lord Shiva. This temple is one of the five temples that represent the cosmic powers and is associated with earth. Here Lord Shiva is worshipped as Ekambareswarar and is depicted as a Lingam with his consort Parvathi. This temple is one of the most ancient temples in India and is believed to have existed even before 600 AD. This is one of the “Pancha Bhoota Stalam” which are dedicated to Lord Shiva and the Ekambareswarar temple is associated with the cosmic element of Earth (Prithvi). The main deity in the temple is in the form of a Linga which is a Swayambumurthi. The temple has many great halls and one of the most popular among those halls is the Thousand Pillar Hall which was built during the reign of Vijayanagar. Legend has it that the Goddess Parvathi made a Linga out of sand and worshipped it under a mango tree. As the nearby Vegavati River threatened to overflow and destroy the Linga, Parvathi embraced the Lingam. Touched by her devotion Lord Shiva came down to Earth and married her at that place. This place then formed the temple that stands today. The Panguni Rath that goes on for 13 days with Silver Rath, Gold Vrushab and Silver Mavadi Servai are celebrated in much grandeur. Thousands of devotees throng to this temple during Pradosham, full moon days and other special days of the Tamil calendar.